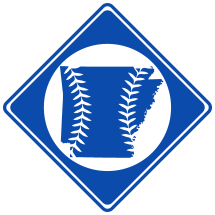 The Little Rock Rose Buds, otherwise known as the Rose City Base Ball Club, were a professional baseball team based in Little Rock, AR in 1894. The team participated in the Arkansas State League. The team was managed by Miles A. Stone, a professor at Little Rock Commercial College. 6/23/1894 Arkansas State League folds. 7/13/1904 Little Rock, AR Uncle Joes W 6 4 Non-League Game. First Night Game in AR.